OK!’s Melanie Thomas escapes to a tropical paradise for a girls-only retreat. 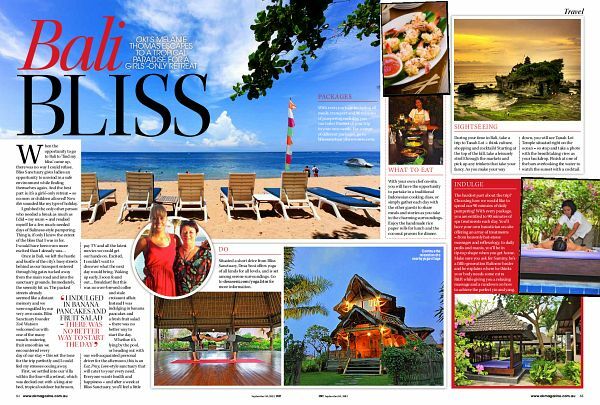 When the opportunity to go to Bali to ‘find my bliss’ came up, there was no way I could refuse. Bliss Sanctuary gives ladies an opportunity to unwind in a safe environment while finding themselves again. And the best part is: it’s a girls’-only retreat – so no men or children allowed! Now this sounded like my type of holiday. Once in Bali, we left the hustle and bustle of the city’s busy streets behind as our transport entered through big gates tucked away from the main road and into the sanctuary grounds. Immediately, the serenity hit us. The packed streets already seemed like a distant memory and we were engulfed by our very own oasis. Bliss Sanctuary founder Zoë Watson welcomed us with one of the many mouth-watering fruit smoothies we encountered every day of our stay – this set the tone for the trip perfectly and I could feel my stresses oozing away. First, we settled into our villa within the four-villa retreat, which was decked out with a king-size bed, tropical outdoor bathroom,pay TV and all the latest movies we could get our hands on. Excited, I couldn’t wait to discover what the next day would bring. Waking up early, I soon found out… Breakfast! But this was no over-brewed coffee and stale croissant affair. Instead I was indulging in banana pancakes and a fresh fruit salad – there was no better way to start the day. Whether it’s lying by the pool, or heading out with our well-acquainted personal driver for the afternoon, this is an Eat, Pray, Love-style sanctuary that will cater to your every need. Everyone wants health and happiness – and after a week at Bliss Sanctuary, you’ll feel a little closer to it. Situated a short drive from Bliss Sanctuary, Desa Seni offers yoga of all kinds for all levels, and is set among serene surroundings. Go to desaseni.com/yoga.htm for more information. With every package including all meals, transport and 90 minutes of pampering each day, you can tailor the rest of your trip to your own needs. For a range of different packages, go to blisssanctuaryforwomen.com. 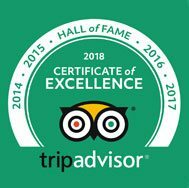 With your own chef on-site, you will have the opportunity to partake in a traditional Indonesian cooking class, or simply gather each day with the other guests to share meals and stories as you take in the charming surroundings. Enjoy the handmade rice paper rolls for lunch and the coconut prawns for dinner. During your time in Bali, take a trip to Tanah Lot – think culture, shopping and cocktails! Starting at the top of the hill, take a leisurely stroll through the markets and pick up any trinkets that take your fancy. As you make your way down, you will see Tanah Lot Temple situated right on the ocean – so stop and take a photo with the breathtaking view as your backdrop. Finish at one of the bars overlooking the water to watch the sunset with a cocktail. The hardest part about the trip? Choosing how we would like to spend our 90 minutes of daily pampering! With every package, you are entitled to 90 minutes of spa treatments each day. You’ll have your own beautician on-site offering an array of treatments – from heavenly hot-stone massages and reflexology, to daily pedis and manis, you’ll be in tip-top shape when you get home. Make sure you ask for Sammy, he’s a fifth-generation Balinese healer and he explains where he thinks your body needs some extra R&R while giving you a relaxing massage and a rundown on how to achieve the perfect yin and yang.